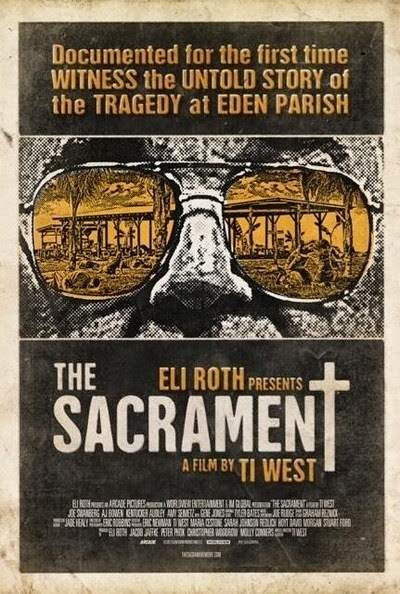 Hip alt-media news outlet Vice sends intrepid reporter Sam (AJ Bowen) to document the Eden Parish religious commune. Invited by the sister of photographer Patrick (Kentucker Audley), Sam, Patrick and cameraman Jake (Joe Swanberg) all head down to the isolated community to document its beliefs and lifestyle. Despite armed guards at the perimeter, everyone in the community seems happy, especially Patrick's sister Caroline (Amy Seimetz). Like nearly all utopias in fiction, however, it’s obvious that “something sinister” is going on behind the pulpit. Spooky music, on edge protagonists and a listing in the horror section tip the film’s hand early. The scenario draws heavily from the Jonestown Massacre of 1978. Father, the congregation’s leader (Gene Jones), even wears sunglasses similar those ever present on real-life cult leader Jim Jones. It’s only a matter of time before Dixie cups and Tang mix get brought out. It’s never quite clear what the religious beliefs of Eden Parish are. Some crosses gives the film a vaguely Christian tone, but no congregant seems like a particularly “true believer.” Perhaps it’s a rigorous Catholic upbringing that left this reviewer puzzled by the theological underpinnings of this congregation. The psychology of Father is left unexplored. He proclaims to abhor poverty, racism and war, but has no problem controlling his congregation with an iron fist. Like all cults, Eden Parish is comprised of society’s rejects. The indigent. The recovering addicts. The lost. They too are rich mines for story, but left unexplored. Nonetheless, The Sacrament is eerie. It has tension. But it lacks any real element of surprise thanks to telegraphing the tone of the film from frame one and basing the film on a fairly well known incident. It gets points for style and an unsettling tone, but an even creepier trick would have been making the audience WANT to stay in Eden Parish. It would have been much more disturbing to depict Father as a likeable character, and to become complicit in his action. Like any monster, cult leaders are scary. But unlike the undead, cult leaders are all too human. Looking into the abyss of what makes them tick and what attracts damaged people to them… that’s horror.